There’s nothing worse than buying bags and bags of Halloween candy and then no one comes trick-or-treating at your door. (Hmm, scratch that — there are definitely worse things.) But anyway. You know your neighborhood leaves something to be desired if you don’t have little ghosts and princesses banging on your door tonight. What makes for good trick-or-treating? Wide sidewalks for a whole ghoulish posse of little ones, with streetlights illuminating their path, not just the roadway. Houses that are close to each other and to the street so little feet don’t have to walk too far to fill their plastic jack-o-lanterns full of candy. Slow-moving cars, or better yet, a street closed to cars for special events like Halloween — and neighbors that know each other well enough to organize something like that. 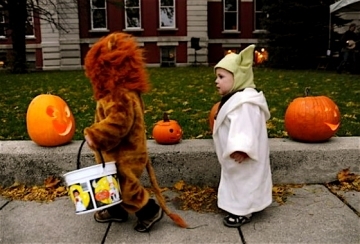 Trick-or-treating is an activity centered on kids, so it puts their needs into sharp relief. They’re not looking for neighborhood streets that prioritize vehicle throughput. They don’t drive. They just want to walk, safely, to a lot of houses in a short amount of time, in a vibrant neighborhood that feels fun and friendly. Leigh Gallagher, author of “The End of the Suburbs,” says close-built houses are “a proxy for community” — and that’s what makes Halloween such a good litmus test for a neighborhood’s health. Zillow‘s attempt to quantify what makes a great trick-or-treat neighborhood kind of missed the mark. They ranked the 20 best cities for candy-gathering (San Francisco, Boston, Honolulu, San Jose…) — and the top neighborhoods within those cities — on the basis of their walk score, crime rates, population density — and median home values. I will refrain from ranting too much about how incredibly messed up it is to include home values in that calculation — IT IS INCREDIBLY MESSED UP — and just say that the other three measures are a sensible place to start. It indicates that smart growth and strategic candy-grubbing go hand-in-hand. Can kids find a well-lit front door, or is it hidden behind a garage? Can homeowners see the street from their windows, or do treaters (and less cute tricksters) walk the neighborhood unwatched? Is there an uninterrupted sidewalk, or do pint-sized ghouls have to traipse through a lawn? Do tree-lined streets slow down traffic, or do speedsters rule the night? The number of kids walking the streets on Halloween, and their candy haul, can be a great indicator of a neighborhood’s quality design. Neighborhoods that fail that test have resorted to making Halloween car-centric. “Trunk-or-treating” is a new, rather disturbing, trend in some suburbs. I thought suburbs were supposed to be safe and kid-friendly, but this is a mess. Parents are holding Halloween tailgating parties in church parking lots, handing out candy from their minivans. No walking off that candy overload, no adventurous neighborhood exploring. Just a safe, controlled environment — as long as everyone is very careful pulling in and out of that kid-filled parking lot in the dark. Some business associations get together for trick-or-treating too — but give me a candy-filled stroll down some fun commercial corridor over Mall-o-ween any day. So Happy Halloween, witches and warlocks. Enjoy your doggy costume contests, your car-free block parties, your pumpkin-spiced cocktails at your local bar, your costume craft workshops, and your special events at the children’s museums and zoos in your city. Or just enjoy the one special night a year when kids get to stay out late, walk instead of ride in the car seat, enjoy the generosity of their neighbors, and gorge on candy. Boo! It looks like Zillow considers my neighborhood the #1 in the city. That’s no surprise as we get mobbed with kids on Halloween. We’re just mildly more walkable compared to the rest of the city but it brings in van loads of families. And it is a little ironic that this originally walk-centric event causes the highest traffic congestion we see all year. A van pulls up, kids spend 15 minutes visiting the houses on the block, then they pile back into the van to get dropped off on the next block. Not all families use “power assisted” trick or treating, but enough to create a hectic street scene. We’re in San Francisco and our neighborhood has the wide sidewalks, well-lit streets, attached houses and light car traffic, but we ourselves don’t actually get many trick-or-treaters because our block is so steep, plus kids get tired climbing up a long flight of stairs to each building. But a few blocks downhill–where it’s flat and where the streetcar stops–it’s a mob scene. So I think elevation should be included in the Halloween metrics. Also, apartment buildings per square block. I’m in a single-family home in a flat area but we’re surrounded by apartment buildings, so the trick-or-treaters go elsewhere. My 100% residential neighborhood growing up didn’t have sidewalks, but we had safe streets because everyone drove responsibly, especially on Halloween. As for trunk-or-treating, that’s the lamest thing ever. In a parking lot, during daylight? Half the fun of Halloween was running around the neighborhood after dark and knocking on strange doors. The other half of the fun was evenly divided between dressing up and free candy. I can’t imagine any kid over six preferring trunk-or-treating to the real deal. I was incredulous when I first read about trunk-or-treating. Once again, we somehow managed to take yet more of the magic and spontaneity out of childhood, replacing it once again with another lifeless, soulless, heavily supervised activity. And we wonder why we have adult children living in their parents basement playing video games when they’re 40? All these childhood activities with other children are ways to socialize children, prepare them for the challenges of life, and also incidentally show them life is not all work. Nowadays every moment of many children’s days are planned-day care, school, after school, enrichment activities, supervised team sports masquerading as “fun”, etc.. You don’t prepare children for adult life like that. I can’t imagine any child of any age preferring trunk-or-treating over the real deal. Is it just my neighborhood or do the parents have more fun with a red wagon filled with liquid “treats” pulled along as the kids go door to door? That is what I will always remember about Halloween, a community coming together, having fun with the kids and keeping it safe. I just heard from a neighbor who counted 2100 trick or treaters last night. Others on her block counted 1200 and 1500. I’m not sure how they handled such a huge volume. The paradox is that their street is one of the few without sidewalks. But they apply for a permit every year to close off the street to make it safer and more enjoyable. Their whole block really gets into it so that probably attracts the unusually large numbers.